Boko Haram has control of a swath of land the size of Ireland and the group’s leader, Abubakar Shekau, says he will rule the land as a caliphate in a fashion similar to ISIS’s Abu Bakr al-Baghdadi. According to Newsweek, Boko Haram is drawing inspiration from ISIS’s success in Iraq and Syria and now operates as “a conventional army in north-eastern Nigeria.” This has resulted in a move from “guerilla tactics” to the tactic of seizing and holding large areas of land. 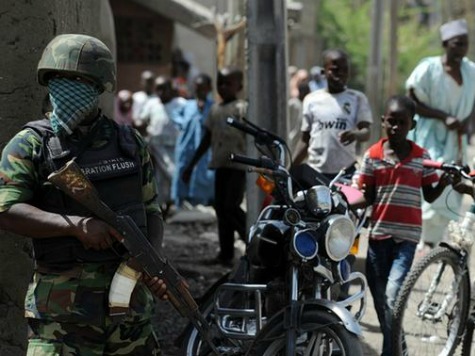 At this very moment, most parts of Borno state are being occupied by Boko Haram insurgents. Government presence and administration is minimal or non-existent across many parts of the state…Most settlements in the affected areas in the state have either been deserted or access to them is practically impossible. On March 2013 Breitbart News reported that Boko Haram destroyed 50 of 52 Catholic churches in the Maiduguri diocese. Reverend Jerome Ituah of Christ the King Catholic Church in Kurudu, Nigeria, was in Maiduguri to lead a retreats for the Bishop and Priests of the diocese when he said he witnessed the destruction first hand. Townhall.com reported that Boko Haram began “systematically” targeting Christians in 2009. The guerilla tactics then in use meant many of these Christians were shot, burned, or chopped to death with machetes.